Welcome to a brand new post! The wonderful guys over at Trinity Leeds invited me to come along to their Wonder Weekend event and I thought that today I would tell you all what happened at Wonder Weekend. A tal; dark green tree in sparkly blue lights all the way up the tree with a big red box supporting it at the bottom on a white floor on a dark background. Wonder Weekend is a weekend long event that is held within the shopping centre Trinity Leeds near around November. Wonder Weekend is a weekend full of well, wonder and things that you would never expect to end up in a shopping centre. 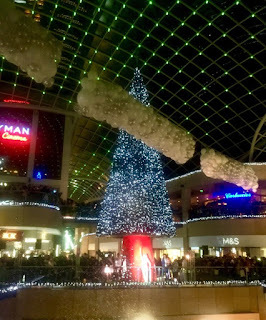 The best part of Wonder Weekend is that as well as attending and participating in these events, you get to experience the lights of the Trinity Leeds Christmas Tree/Wishmas Tree being turned on for the very first time that year. I started by going straight to the belly of the wonderful beast. The Ball Pit and Bar space. This space was turned into a massive ball pit with a bar and some brands offering free goodies next to it. Sadly, due to the amount of people as Wonder Weekend was open to the public, I decided to not go into the ball pit but I did get to try one of Meatliquors amazing burgers for the first time and I absolutely loved it! After the ball pit, I decided to carry on and go to the Sherbet Shack which contained wonderful sweets for the taking! Carrying on from this, I then went to decorate my own Toffee Apple which I absolitely loved as it meant that I got to dip my own Apple into the Toffee. I love it when I get to create something and take it home! I then made my way to the viewing area for the switch on of the Wishmas Tree Lights. This bit was hosted by the wonderful Jojo that works at Capital FM. This part of the event included acrobats, singing, dancing and much more. After a while, the lights were switched on which made the shopping centre look wonderful and sparkly, there were things such as balloons that descended from the top of the shopping centre to the bottom. I then slowly made my way towards Everyman Cinemas to have a look at their Slumber Cinema. Sadly as I think a good few decided to do this after the switch on, it was still quite packed for myself to fully embrace it but I think that this is a wonderful idea as it encapsulates being wonderful and rested but cosy at the same time. I think that Everyman should do something like this more often. I then decided that it was time to head off back home even though I felt completely festive and wanted to smother myself in things such as Spicy Hot Drinks and luxurious food which is associated with the festive times. Thanks to the wonderful PR team that invited me to this event and to Trinity Leeds for putting on such an amazing event. I hope that you have enjoyed reading this festive post and that you come back next time for another blog post!